For welding 9 ga cupped head and 14 ga straight resistance weld pins to sheet metal duct. 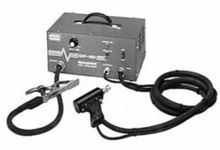 The AGM Model DP-150 is a portable, solid state resistance welder. It was designed for welding 9 ga (3.76mm) cupped head and 14 ga (2.03mm) straight resistance weld pins to galvanized sheet metal ductwork. Its light weight and extra long gun lead make it perfect for shop or field use. The complete system includes the Power Pack with adjustable timer, lightweight gun with permanently connected weld/control leads, and heavy duty permanently connected ground lead with spring loaded copper alloy clamp. The Model DP-150 is capable of welding the 9 ga pins at a continuous rate of 8 per minute, and the 14 ga pins at a continuous rate of 12 per minute. Faster rates are possible for short durations. For optimum results, the base metal should be 24 ga or thinner, though satisfactory results may be obtained on thicker metals. The main transformer in the power pack provides the source of energy for the weld, with timing controlled by the solid state timer and weld relay modules. This system will assure you of high quality welds each and every time. AGM uses only the highest quality components in the manufacture of its equipment. All components are designed for long and rough usage, thereby assuring you of many hours of trouble free operation. The system is designed to operate at a nominal 220 volt AC input. However, it can operate efficiently from 190-240 volts simply by moving a single wire on a terminal strip inside the welder. The weld gun has a comfortable pistol shaped handle with an operator actuated trigger button. The weld can be controlled by keeping the trigger depressed during the entire pre-set timing cycle, or stopped at any point before the cycle ends by releasing the trigger. Make the Model DP-150 resistance welder your answer – for simplified fastening, increased productivity, improved product appearance and technological reliability. Weld Rate: Up to 8 - 12 per min.